Maurice Joseph Micklewhite icha Michael Caine sutiyuq runaqa ( 14 ñiqin pawqar waray killapi 1933 watapi paqarisqa Rotherhithe llaqtapi - ) huk HQS Hukllachasqa Qhapaq Suyu mama llaqtap aranway pukllaqmi qarqan. Oskar Suñay (1986 wan 1999). Taytan: Maurice Joseph Micklewhite (1899–1957); Maman: Ellen Frances Marie Burchell (1900 – 1989). Churinkuna: Dominique Micklewhite (*1956) wan Natasha Micklewhite (*1973). 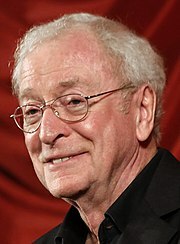 Commons nisqaqa multimidya kapuyninkunayuqmi kay hawa: Michael Caine. Kay p'anqaqa 11:04, 20 dis 2016 qhipaq kutitam hukchasqa karqan.